This was probably the first pecan pie I’ve ever tasted. I can’t really explain why either because I like pecans and, obviously, I like sugar. I think it must have been because of the gooey texture and pecans and not thinking that would be a worthwhile dessert. Foolish me. I loved it. But, I don’t think this recipe was the best. I should have been scared off by the commentary about other readers having difficulty with the bake time. When I peaked at the pie after 30 minutes of baking to remove the foil, the pecans had not risen to the surface as I had expected. However, when I removed the foil, which had sunken into the pie, the top layer was also removed, revealing the pecans on top. You can kind of see some of the syrup mixture above the pecans around the edges in the picture above. Regardless, I still really liked it. 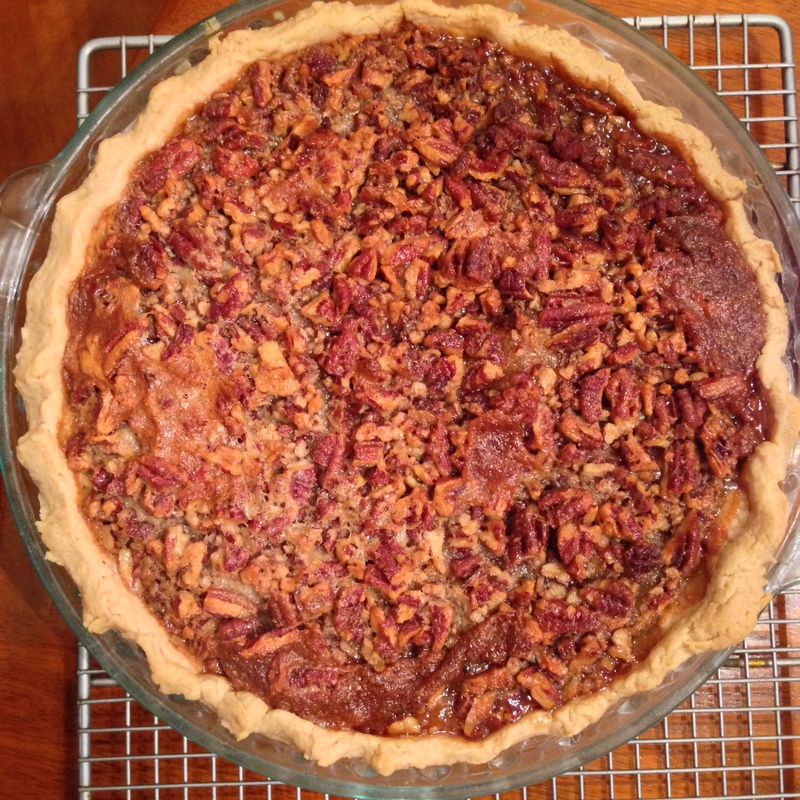 I’m probably on a quest to find a better recipe for next year, but I liked that the pecans in this recipe were chopped and created a mosaic of pecan crumbs on top of the pie. I am curious about recipes with chocolate (I didn’t make one of these because we were already having chocolate pie) and ones with a greater portion of brown sugar or dark corn syrup. Based on recipes found here. Preheat oven to 350 degrees. Roll out dough and place into 9″ deep dish pie plate (1.5-2″ deep). Trim overhang, using leftovers for more pie crust, decorations, or pie crust cookies. Crimp the edges. Mix together sugar, brown sugar, salt, corn syrup, vanilla, butter, and eggs in a medium-sized bowl. Pour chopped pecans in the bottom of the unbaked pie crust. Pour syrup mixture over the chopped pecans. Cover lightly/gently with aluminum foil. Bake at 350 degrees for 30 minutes, then remove foil and bake for another 20-45 minutes until pie is set and not overly jiggly. When done, allow pie to cool completely.